What the heck — I only added 5 pounds to the bar! Why does it feel so heavy? Maybe you’ve done it — added a mere 5 pounds to the bar, lifted it for a few reps, racked the bar and immediately checked the plates. Surely you did the math wrong and added more to the bar than just 5 pounds. Nope. The math was right. You added a 2.5-pound plate on both sleeves of the barbell. Why did that 5 pounds feel more like 15? Most gyms have weight plates in the following amounts: 45, 35, 25, 10, 5, and 2.5 pounds. That means the smallest increase possible for a barbell exercise is 5 pounds (a 2.5-pound plate on each side). This 5-pound jump isn’t usually drastic for a squat or deadlift, since these two exercises can handle a lot of weight and can grow substantially. For example, a beginner may start out squatting an empty 45-pound barbell, but she can quickly progress to squatting 125 pounds or more in a few months. Deadlift, squat, bench press, press — that is the order of the major barbell lifts from strongest and heaviest loading potential to the least. As you can see, the press has the lowest strength and loading potential. Whereas a woman may progress to bench pressing 115 pounds for numerous reps, she may have to fight her way to attain an 85-pound press. Strong woman competitors and powerlifters aside, the average female trainee will have a difficult time pressing 95+ pounds overhead and getting close would require specialized programming. Do you see the problem with 5-pound weight increases yet, particularly for upper body exercises? This is where fractional plates become exceptionally beneficial. Why are Fractional Plates Beneficial for Women? Because you can add a more manageable weight increase to the bar than standard weight sets allow. Instead of a 5-pound increase, fractional plates give you the ability to add 1 pound to the bar, or less. I know what you’re thinking: I don’t want to add a single pound to the bar! That’s pathetic! That, my well-meaning friend, is your ego talking. That has been my ego’s words too. Shut her up; she doesn’t serve your short- or long-term training interests. Your ego has no place in the weight room if you want to make the best progress possible. Let’s bring this to life with an example. 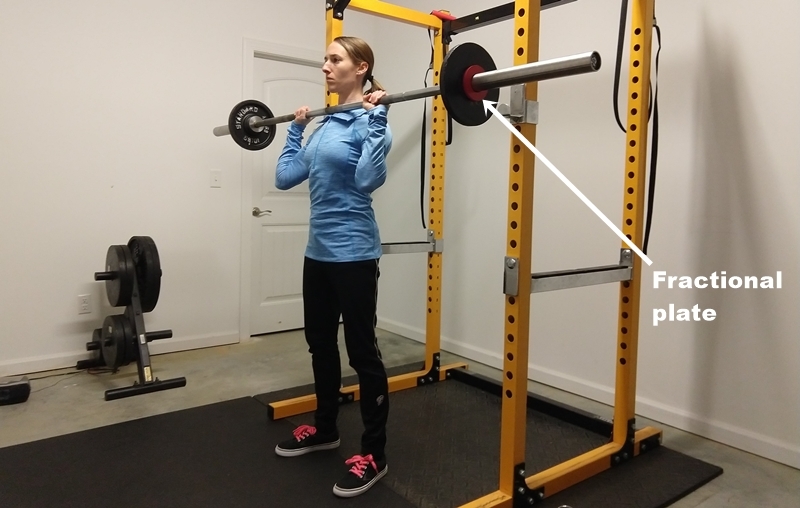 A woman is on Phase 2 of Lift Like a Girl and she performs the standing press with a standard 45-pound barbell for 4×7 (4 sets, 7 reps); she’s ready to add weight to the bar to build more strength. She uses the smallest weight increase possible at the gym: a 2.5-pound plate on each side, for a 5-pound increase. But she could barely squeeze out 3 reps despite “only” increasing the weight 5 pounds. What the heck happened? We need to put this 5-pound jump in perspective: those 5 additional pounds increased the weight by more than 10%. Now you see how significant that increase is. And that is a perfect example why women must use fractional plates with barbell exercises, especially as they get stronger. When you look at a weight increase by a percentage instead of pounds, you immediately see the benefit of fractional plates: Increasing the weight by 2% is significantly more manageable than 10%. Let’s compare two trainees on Phase 2 of Lift Like a Girl. That program focuses on building strength with the double-progression method. The goal is to perform 4×5-7 (4 sets, 5-7 reps). Once the trainee performs 4×7 with the same weight for all sets, she is to increase the weight slightly. Trainee A makes a 5-pound jump, since the smallest plates at her gym weigh 2.5 pounds. Trainee B makes her own fractional plates (details to follow) so she can increase the weight by 2% instead of a mandatory 5 pounds. Trainee B stayed in the 5-7 rep range and improved her performance every week by adding weight or performing more reps for each set. This is why I say in Lift Like a Girl to use fractional plates. It makes a tremendous difference. But 50 pounds has to be better, because it’s heavier, you may think. In this context, it is not when you look at total training volume (i.e., total weight lifted when you multiple the weight by the total number of reps performed). That is a difference of 688 pounds! Even if Trainee B added a single pound on Week 2 and performed 4×5, that total training volume is over 300 pounds more than Trainee A who used 50 pounds. Smaller weight increases — even a single pound — are, in fact, much better in this example. I use fractional plates in my own training. I’m currently running a muscle-building program and, for example, bench press for 5 sets of 8-15 reps. Last week I benched 115 pounds for 8 reps and increased the weight to 117.5 (approximately 2%) this week. I performed 8 reps with the heavier load. (I would’ve been happy with 7 reps, and would’ve stuck with that weight the following week with goal of hitting 8.) Because I hit my goal of 8 reps, I’ll increase the weight 2% again, to 120 pounds, the next workout. 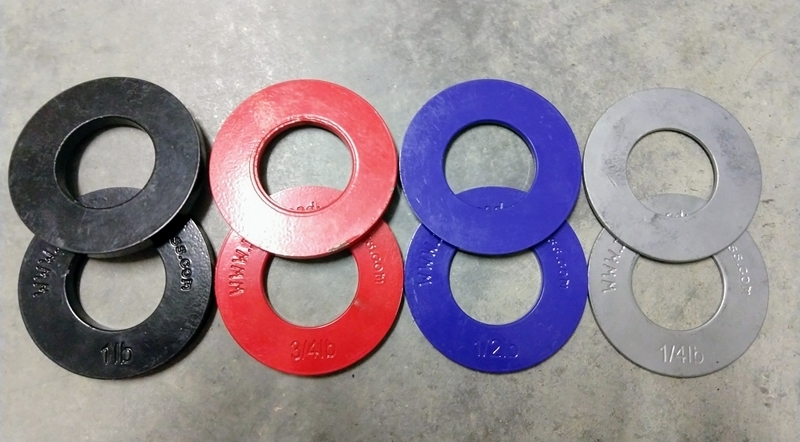 You’ve got two options: make your own fractional plates or buy a set. I had no idea you could make your own fractional plates when I purchased mine over a decade ago. Do yourself a favor and make your own; you’ll save quite a bit of money. Go to your local hardware store and buy 2-inch washers (standard barbell sleeves are 2 inches in diameter). Weigh them into 1-, .50-, and .25-pound stacks and glue them together (a kitchen scale works well for this). Voila! You have fractional plates for a fraction (cheap joke, but I don’t care) of the cost. Don’t want to bother buying, weighing, and gluing washers together? Buy a ready-made set. I bought a set years ago that has a pair of 1-, .75-, .50-, and .25-pound plates. I can add just one-half pound to the bar if I want to. If you’d rather get a made-for-you set, you can check out the sets from Micro Gainz and Ader Fitness; they got rated well, but I’ve never used them so I have no personal opinion. (The set I bought over a decade ago is no longer available.) You can no doubt find more options online. What Percentage Increase Is Best? In the beginner stage of strength training, most women can add 5 pounds to the bench press, and maybe even the standing press, for the first several weeks to first couple months; and likely 10 pounds for squats and deadlifts the first several weeks. After the first couple months of training and initial quick strength gains, it can be helpful to increase the weight of barbell exercises by a percentage instead of a fixed 5 pounds. An increase of 2-5% is a good target. Someone in the earlier stages of training can likely increase the weight 5%, whereas someone with a year or more of consistent training experience and strength may do better with a 2% increase. Once you’ve been strength training for a couple months, start using fractional plates, especially for upper body exercises, so you can milk out all additional strength gains and achieve the best possible results. Like what you just read? Never miss a thing. Join the free newsletter; you’ll also receive the Beautiful Badass Mini Course as a free gift. Enter your email below.